"Black (or white) sesame is a great addition to some sushi rolls. It adds a nice color pattern to the sushi roll, it's crunchy and tastes really nice. Check it out." 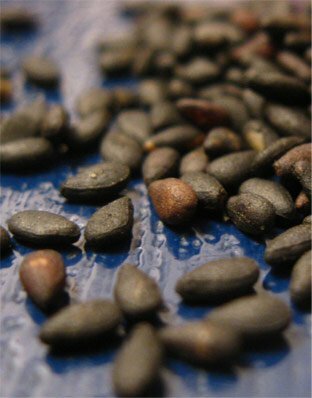 Black sesame is a kind of salted & toasted sesame used to decorate and enrich flavor. There isn’t much to elaborate on the matter of using it, simply sprinkle as much as you dare on top, or all around an inside out sushi roll to create the desired ratio of black spots on rice white background of the roll. 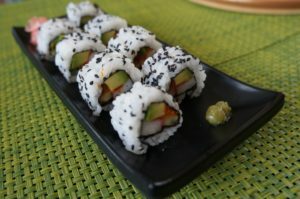 One good example of black sesame used on top of a sushi roll is the home made california sushi roll below. Find out more in the california roll recipe page. The taste, by the way, is not that dominant, nevertheless sensible. Give it a try! I love black sesame – where do you get it?